If you can make computer chips that channel light, why not fiber optics that control electricity? 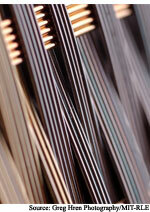 By making optical fiber with metal wires in it, researchers have built a photodetector in a fiber. The advance opens the way to optoelectronic devices that can be woven into projector screens, fences and car windshields. It's easy for people to tell whether a review is positive or negative. It's much harder for computers because they have neither feelings nor understanding. Software that leaves out objective sentences is better at the task than systems that churn through whole documents. The smaller something is the faster it vibrates, which makes nanomechanical devices promising as the next generation of high-speed, high-capacity memory technology. The challenge is being able to manufacture millions of the devices on a chip. A prototype nanomechanical memory cell made from silicon could be the answer. Antennas are little more than long, thin metal rods. As molecular-scale metallic cylinders, carbon nanotubes should work as antennas as well. But because the signals an antenna receives consist of wavelengths that are close to the antenna's length, nanotubes should receive and transmit lightwaves rather than radio waves. Researchers have shown that this is the case, opening the way for new types of communications equipment and solar cells.